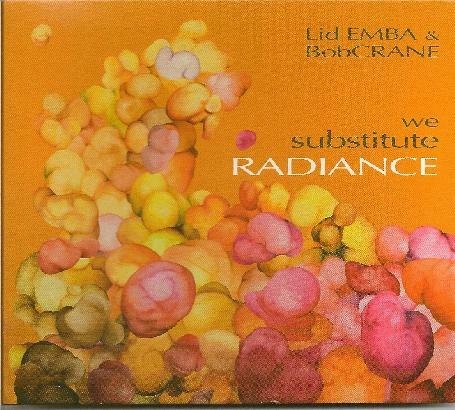 Lid Emba & Bob Crane - "We Substitute Radiance"
Lid Emba & Bob Crane travel through the ambient chaos of drone and bleep, manifesting electronic drumbeats and distorted guitars with passion and atmosphere. Spacey and manic, solid and driven, they weave tapestries of electronic, computer-generated soundscapes over the course of this 40-minute CD. The atmospheres in places are sci-fi film in style, and they move like ticks, crawling over the skin, looking for the soft spots to feed on. Mixing tinkles with flutings with Martians landing etc. However, this is not the full journey, there is more to be had when the tempo changes, and the guitars enter. Grunge-like droning at times, tinny twinklings at others. It is interesting stuff, Resident Evil soundtrack sounding in places, like that of Marilyn Manson, Tangerine Dream-ish in others. I like it, but it could be termed as a hard listen. I know that many will see it as a bit too random, but that is the nature of the beast, and that is beauty of individuality. I would be hard pushed to listen to it again mind you, but maybe I will. I would have preferred if it did not have gaps in between each track. It sort of lost the momentum for me sometimes, and in my opinion, it would have flowed smoother if it all joined together. However, that is a minor thing. Overall, it was an interesting journey, highs and lows, heavy and mellow, guitar drones and drum poundings, interesting stuff.